I just finished spending a half hour playing Little Magicians, a memory game by Haba perfect for little pre-readers. The game is pretty simple. Players roll a die that advances a Merlin character 1, 2 or 3 spaces. Each space a player lands on is marked with an animal including a cat, a raven, an owl, and a dragon. The magic begins when the player has to find the matching animal hidden under nine different magician’s hats on the game board. Using a magnetic wand, the player lifts up one hat. If he’s right, he gets a token. Wrong, and the game simply advances to the next player. 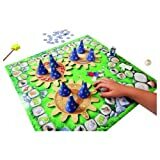 For extra fun, the game board has a very simple cog and wheel mechanism that moves the hats and hidden animals just enough to complicate memorizing where they are. While older parent-age players are not likely going to race to play this after the kids have gone to bed, the memory portion of the game is challenging for all ages and mom and dad were happy to play two games each of the game. We especially liked that the game is estimated at 15 minutes for each round (time featured on the box) so we could easily volunteer to play a game without committing to an hour-long endeavor. My six year old son, while perhaps at the tail end of the age range for really being excited about this game, liked it enough to pull it out again and ask everyone, including his big sister to play again. Dads would be well-advised to read the directions before opening the box and pulling apart the many parts. Dads, including this one, can become impatient when little hands start spreading all the playing pieces before the structured play begins.